Hi! 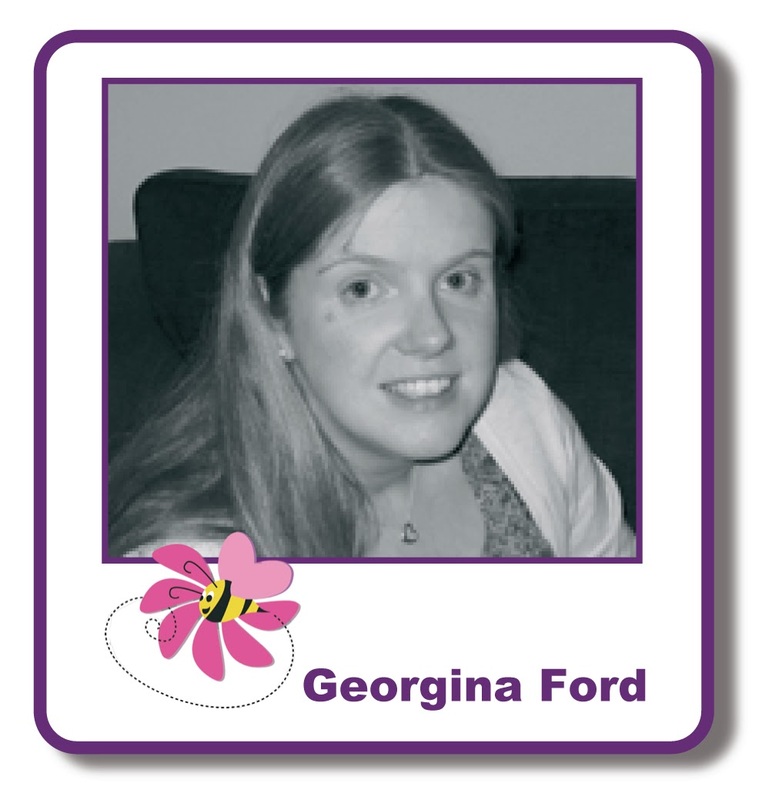 It's Thursday so it's Georgina with my weekly post. This is my first post as part of the Card-io promotion and giveaway. 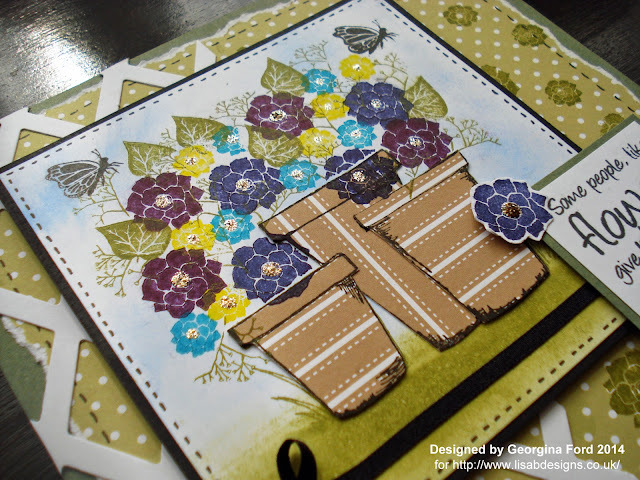 I have a card to share with you using Card-io stamps and Anna Marie Designs card. 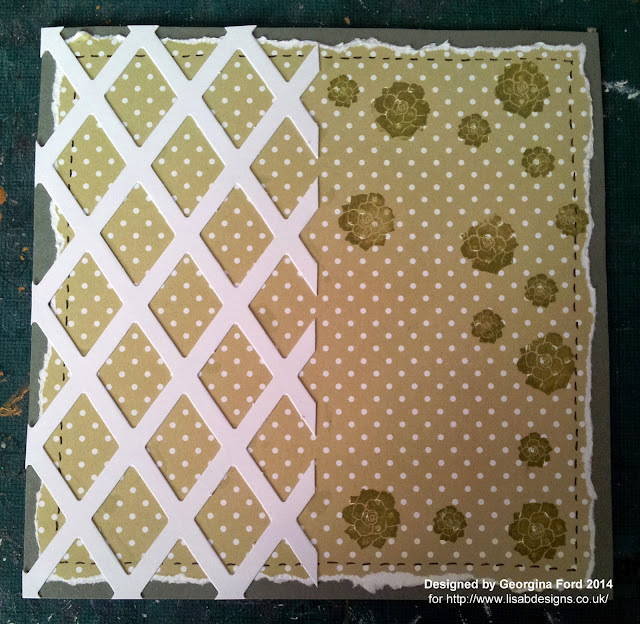 To make this card I started by covering a 148x148mm white card blank with green card. Onto this I added a square of Sage Green dottie card. I tore the edges of the dottie card instead of cutting. I added black faux stitching around the edges. I added a panel of die-cut Trellis card down the left hand side. To finish the background I stamped the flowers from the Begonia garden Card-io stamp set with Versacolor Bamboo ink pad. I cut a square of white card. Onto this I stamped the flowerpots from the Lots of Pots stamp set with a Versacolor Brown ink pad. I added a sky and grass with Tumbled Glass and Forest Moss Distress ink pads. 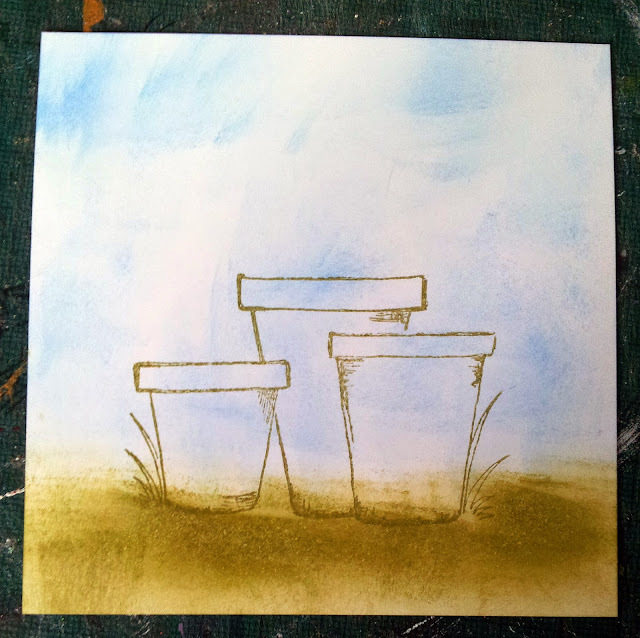 I then stamped the flowerpots again onto Striped cafe latte card. I cut them out and attached them onto the original stamped flowerpots. 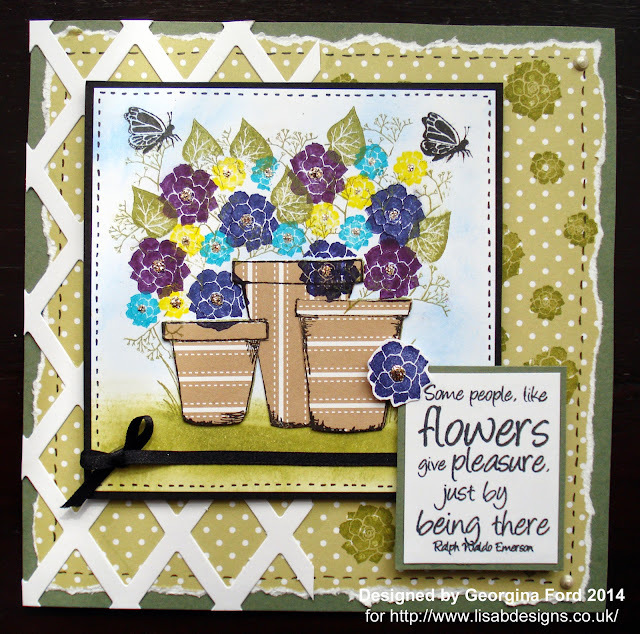 For the flowers and leaves I used the pretty Card-io Begonia garden stamp set. I stamped the leaves in Bamboo and the flowers in Canary, Grape, Neptune and Turquoise Versacolour ink pads. I stamped the sentiment with a Memento ink pad. The sentiment was from Say it with flowers sentiment stamp set. To finish the card I added Platinum Stickles to the centre of the flowers, black ribbon and faux stitching. This is so beautiful. I love the design and gorgeous colours. Thank you for your clear instructions. Great card. Love how you have built up the image and used stamping on the background paper too.